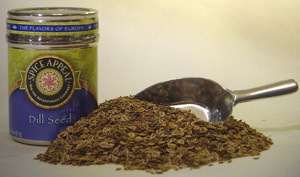 Believed to have magical properties, Dill was considered a valuable ingredient in love potions and aphrodisiacs. This tiny, flat seed has an anise-like taste and packs a sweet, slightly sharp and pungent flavor. Add to pickled cucumbers, dill pickles, sauerkraut, potato salad, bread, soups and stews. Add to salad dressings and seafood for that extra zest.